After some welcoming words of ICMAB Director Prof. Xavier Obradors, and a first video showing some moments of Volodya's life, Prof. Mark Kartsovnik, arrived from Technische Universität München, gave a nice talk about Volodya's research on superconductors, and about the early stages of his research career. Following the Coffee Break, Prof. Josep Fontcuberta, from the MULFOX group, Prof. Enric Canadell, from the Theory and Simulation group, and Prof. Jaume Veciana, from the NANOMOL group, talked in a friendly and informal way about their relationship with Volodya, and their work together. Volodya collaborated with many different researches while at ICMAB, in the field of inorganic oxides, superconductors, organic nanoclusters, and much more. All the speakers emphasized Volodya's precision in working, his persistance in getting the work done, and his desire to collaborate and work in different projects. 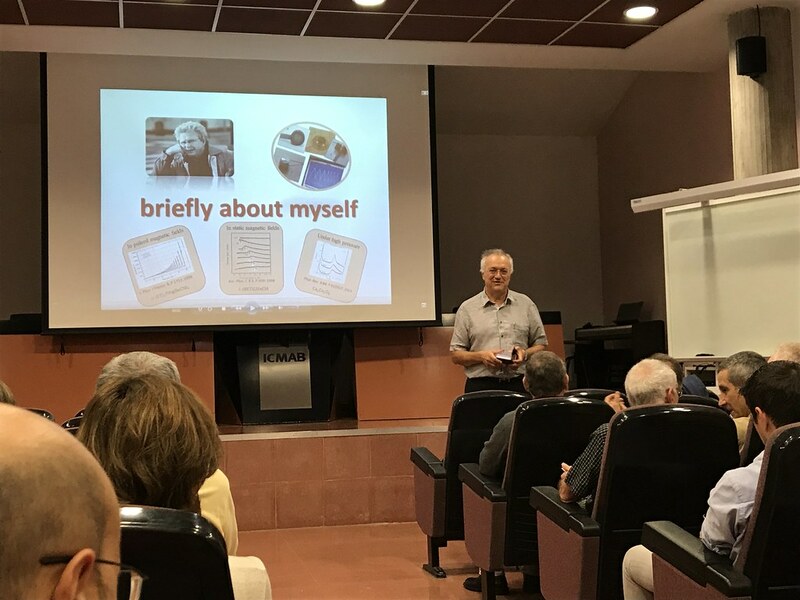 Representing the ICREA community, Emilià Polà, Execute Director at ICREA (Catalan Institution for Research and Advanced Studies), was also invited to the event, and said some nice words for Prof. Vladimir Laukhin, who joined ICMAB with the first ICREA call, in 2001. ICREA was created to boost the research system of Catalonia via the recruitment of top scientists and their integration in Catalan universities and research centers. Currently ICMAB counts with four ICREA scientists: Núria Aliaga-Alcalde, Alejandro Goñi, Massimiliano Stengel and Pablo Vaccaro. To round up the Retirement Reception, Prof. Concepció Rovira was in charge of giving some gifts to Volodya, including all his published papers gathered in two nice volumes, and a photo-album of some of the moments lived together since the day he arrived in Barcelona, in 1994, "the best city of the world", on his own words. All in all, a very nice, emotional, and memorable event. We hope that Prof. Laukhin enjoyed, surrounded with all his friends and coworkers. Thank you all for joining!